In Sept 2011, the Burns statue on The Green in Fredericton was re-dedicated with pomp and ceremony including several bands. 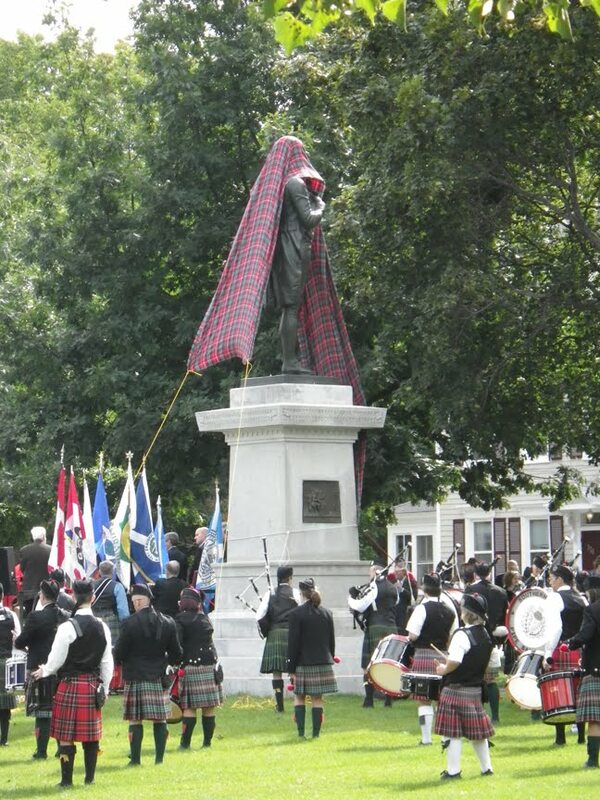 The above photo taken before Rabbie was unveiled. To start today's APB episode, in memorium for Wolastokwiuk elder Gwen Bear who passed away unexpectedly this past weekend, I play the legend of "Koluskap and the Giant Beaver" as told by Gwen Bear. Joe Blades & Biff Mitchell on F'ton affirs, the trails, & Robert Burns. Hamish MacDonald: A ode to commemorate the opening of the first international robert Burns school. Fredericton poet–artist, Joe Blades, wears a Trail of Poems in the Charlotte Glencross Gallery, on his journey towards becoming a man of letters. The Charlotte Street Arts Centre is pleased to host Blades as writer-in-performance during his upcoming solo exhibition that will feature large-format photo-based works, along with text-based and mixed media artworks. Blades’ work is presented in partial fulfillment of a Master in Education degree in Adult Education at the University of New Brunswick. 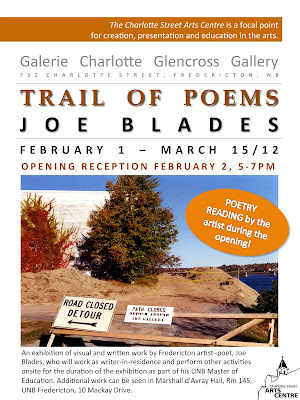 Join us for the opening reception of Trail of Poems on Thursday, February 2 from 5–7 pm, where Blades will give a free poetry reading to launch his six-week series of onsite activities. Trail of Poems addresses Blades’ research questions that consider his artistic oeuvre and the path he has created to arrive at where he is today. Blades invites the public to visit both the Charlotte Glencross Gallery at the Charlotte Street Arts Centre and Room 145 in Marshall d’Avray Hall (UNB), where his works will be displayed concurrently in order to literally and metaphorically connect the dots, pebbles, or breadcrumbs of his art and education journey. For over thirty years, Blades’ artist life and its continuing output of words and images have led him to his current engagement in arts-based research in adult education. He has exhibited hand-bound book works, photographs, mixed media pieces, and objets d’art in group shows across Canada and Europe. “Joe Blades has become a Fredericton landmark, and we’re extremely pleased to support his work in this way,” says WhiteFeather, Executive Director of the Charlotte Street Arts Centre. Join us at the Charlotte Glencross Gallery to understand the importance of one’s own reflection on life and where that can lead, through art. All are welcome to attend the opening reception and to return to visit Blades during his performance residency. The exhibition will run until March 15, 2012. The Charlotte Street Arts Centre opens the doors of creative expression to all. Changing landscape of documentary filmmaking: (moderator: Rachel Bower), Greg Hemmings, Rob Turgeon, Paul MacNeil (National Film Board of Canada). Recorded in the Industry Series of the Silver Wave Film Festival, Fredericton, NB, 4 November 2011. Lorna Drew Maltese Poodle book launch (recorded 22 Sept 2011 @ Westminster Books, Fredericton). Los puentes del Rio San Jaun/Bridges over the Saint John River (Broken Jaw Press) book launch by editors Nela Rio and M. Travis Lane with contributors Lynn Davies, Jo-Anne Elder, Sophie M. Lavoie, & Joe Blades (recorded 22 Sept 2011 @ Westminster Books, Fredericton). John Terpstra & Bart Nameth: "Beach". Catherine Kidd & Jack Beetz: "Sea Peach".